What if you could reduce facial wrinkles today… without surgery? Pellevé™ is indicated for the cosmetic correction of mild to moderate facial wrinkles for certain skin types. Possible side effects of Pellevé™ are usually treatment-site related and include mild discomfort during the procedure localized within the treatment area. Mild swelling (edema) and redness (erythema) may occur during or after a radiofrequency skin treatment. Initial studies of Pellevé™ Wrinkle Treatments have reported that erythema typically resolved within 2 to 24 hours after treatment. 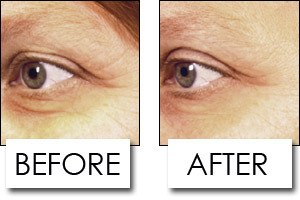 Pellevé can be used to treat the skin on the face, including the eye area. What should I expect during the procedure? You will feel a deep warming sensation each time the Pellevé handpiece touches the area being treated. Because no anesthetic is required, you’ll be able to describe the depth of the feeling to your doctor, which will help to ensure the best possible results. Possible side effects of Pellevé include mild discomfort during the procedure within the area that was treated. Mild swelling and redness may occur which typically go away within 2 to 24 hours. How long does a Pellevé procedure take? Your Pellevé procedure will typically take about 45 to 60 minutes for a full facial treatment. Because Pellevé doesn’t require anesthesia or downtime, it fits easily into your busy schedule. Many people start to see results immediately after just one treatment, with lasting improvement for up to 6 months as your skin produces new collagen. Your doctor will recommend the number of treatments that would be most beneficial for you. Pellevé has been proven to provide safe and effective skin tightening in medical studies.Because Pellevé is a non-invasive procedure, meaning no surgery is required, there are minimal side effects and discomfort. Unlike other skin tightening systems, no anesthesia or skin cooling is needed during your Pellevé procedure, so you can return to home or work immediately following treatment. Does Pellevé have FDA clearance? Pellevé has received clearance from the FDA for the non-invasive treatment of mild to moderate facial wrinkles for certain skin types. Talk to your doctor to find out if Pellevé is right for your skin.